The 1st International Workshop on Vineyard Mechanization and Grape and Wine Quality will bring together scientists interested in any operation performed in vineyard management from pre-planting to senescence not excluding robotics and ground application of precision viticulture. Under the pressure of increasing competitiveness in the global wine market associated with reduction in skilled labor and price tags, that the desired grape composition has to cope with stable and remunerative yields as well as cost reduction is becoming a must in both Old and New World Viticulture. 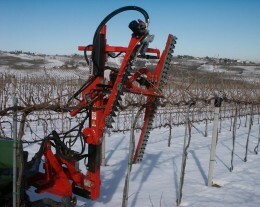 Mechanization is a key factor to restrain production costs as it is well known that about 70% of the total man-hour requirement for vineyard management is due to harvesting and pruning. Hosted by the Istituto di Frutti-Viticoltura of the Agriculture Faculty of the Università Cattolica del Sacro Cuore, the Workshop will be held in the one of the Congress Hall located by the Agriculture Faculty in Via Emilia Parmense 84, 29122 Piacenza (Italy). The Workshop venue is located nearby the "Colli Piacentini" DOC area nowadays featuring about 6,500 hectares of vineyards planted on surrounding hills characterized by gentle slopes and altitude varying from 150 to 500 m a.s.l. The Workshop program will include contributions from international key-note speakers as well visits to vineyard with machine demonstrations. The Proceedings of the Workshop will be published as a volume Acta Horticulturae. We look forward welcoming you in Piacenza June 27-29, 2012. >> Please, mark these dates on your agenda.